The joy of members of the Miango community in Bassa Local Government Area of Plateau State knew no bounds as they came out in their numbers to witness the commissioning of a new borehole sank by the Catholic Archdiocese of Jos. 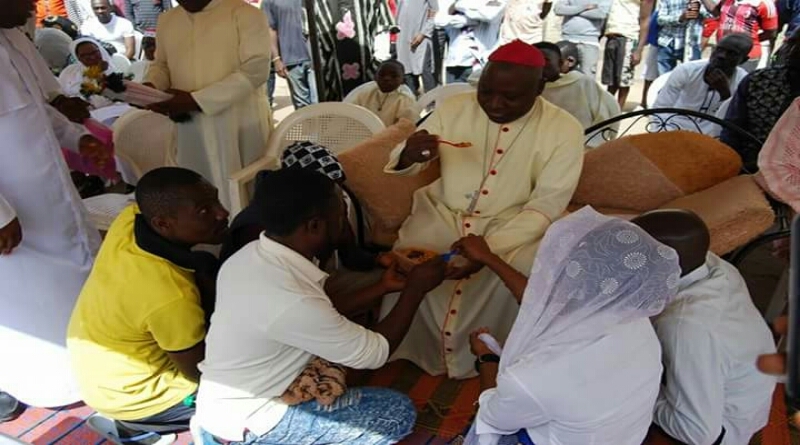 Performing the brief but historic ceremony on December 8, 2017, which featured a special prayer for peace and appeal for reconciliation, the Archbishop of Jos, Most Rev. Ignatius Kaigama expressed happiness amidst the unprecedented crowd that gathered to witness the ceremony. He stressed the importance of water to humanity and appealed to the beneficiary to make good use of the borehole noting that water should be seen as a unifying factor. Kaigama used the medium to condole the community over the recent attacks by gun men which led to the death of many souls and condemned in totality those behind the heinous act and pray for unity, love, peace and understanding among them all. He solicited for peace among them saying God has a purpose of bringing all the different ethnic groups together. On his part, the paramount ruler of Irigwe land, Bra Ngwe, Irigwe, Rtd. Rev. Ronku Aka while welcoming the Archbishop, appreciated the kind gesture of the Catholic Church and prayed God for more blessings, saying they waited for long for the day the community would enjoy good water. Also speaking, Secretary of the Local Government Council, Sir John Tanko thanked the church for such a kind gesture. He said they were deeply touched by the act, maintaining that it would further strengthen their love for one another. Earlier in his address, Parish Priest of St. William’s Parish, Kwall, Rev. Fr. 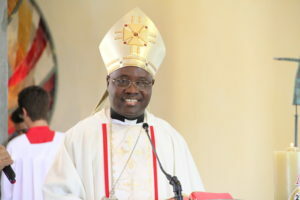 Matthew Danboyi thanked the Archbishop for his magnanimous spirit towards humanity and the church and prayed for better days as he pilots the affairs of the Archdiocese. The event was witnessed by dignitaries including the District Head of Miango, Daniel Chega, District Head of Kwall, Mallam Halabiti Dodo, former Education Secretary, Chief Andrew Iza, amongst others. CHRISTMAS: JOY TO THE PRISONERS!